They used it at potlatches, and they put feathers in the top of it. And when they shook the head around at a certain time, the feathers would start going up in the air and settling among the people. 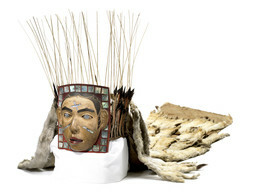 During potlatch and spirit-possession ceremonies, a high-ranking Haida woman or man would wear a magnificent headdress with a carved wooden frontlet, a crown of sea lion whiskers, and a floor-length train of white ermine pelts. Before a dance the whisker crown was filled with swan or eagle down, which drifted out during the performance and fell on the spectators like snow. This late 19th century headdress is a portrait of Soodatl, the twelve-year-old daughter of Chief Daniel Eldjiwus of Skidegate. Pieces of abalone on the girl’s forehead and cheeks represent the custom of sticking pieces of the shell to the face with spruce pitch.